TEL AVIV – A Vatican document released yesterday blamed the Israeli-Palestinian conflict and Israel's "occupying" of lands for driving Christians out and making life difficult for those who remain. However, Christians here who fled their homes in Palestinian-controlled territory largely blamed Muslim intimidation for their plight in interviews with WND. The Vatican document leaked to the media is reportedly a guide for discussions for an upcoming meeting of Mideast bishops convened by Pope Benedict XVI to discuss the plight of the Christian minority in the Middle East, which has an overwhelming Muslim majority. According to the Associated Press, the meeting document made clear bishops in the Middle East believe the Israeli-Palestinian conflict is the central cause of several conflicts in the region. The document also claimed Israeli "occupation" was a major factor in driving Christian out of certain lands. The document also described the growth of "political Islam" in countries like Egypt. The Vatican is not alone in blaming Israel for fleeing Christians. Scores of media reports have claimed a security barrier that Israel constructed on a border with Bethlehem primarily had caused Christians to flee the historic Christian city. Israel built the barrier seven years ago. But Bethlehem's Christian population started to drastically decline in 1995, the very year the Palestinian Authority took over the city in line with the U.S.-backed Oslo Accords. Bethlehem was more than 80 percent Christian when Israel was founded in 1948. But after the PA took control, the city's Christian population plummeted to its current 23 percent. The statistic is considered generous since it includes the satellite towns of Beit Sahour and Beit Jala. Some estimates place Bethlehem's actual Christian population as low as 12 percent, with hundreds of Christians emigrating each year. As soon as he took over Bethlehem, then-PA leader Yasser Arafat unilaterally fired the city's Christian politicians and replaced them with Muslim cronies. He appointed a Muslim governor, Muhammed Rashad A-Jabar, and deposed of Bethlehem's city council, which had nine Christians and two Muslims, reducing the number of Christians councilors to a 50-50 split. Arafat then converted a Greek Orthodox monastery next to the Church of Nativity, the believed birthplace of Jesus, into his official Bethlehem residence. Suddenly, after the Palestinians gained the territory, reports of Christian intimidation by Muslims began to surface. Christian leaders and residents told WND they face an atmosphere of regular hostility. They said Palestinian armed groups stir tension by holding militant demonstrations and marches in the streets. They spokes of instances in which Christian shopkeepers' stores were ransacked and Christian homes attacked. They said in the past, Palestinian gunmen fired at Israelis from Christian hilltop communities, drawing Israeli anti-terror raids to their towns. In 2002, dozens of terrorists holed up inside the Church of the Nativity for 39 days while fleeing a massive Israeli anti-terror operation. Israel surrounded the church area but refused to storm the structure. Gunmen inside included wanted senior Hamas, Tanzim and Al Aqsa Martyrs' Brigades terrorists reportedly involved in suicide bombings and shooting attacks. More than 200 nuns and priests were trapped in the church after Israeli hostage negotiators failed to secure their release. Some Christian leaders said one of the most significant problems facing Christians in Bethlehem is the rampant confiscation of land by Muslim gangs. "There are many cases in which Christians have their land stolen by the [Muslim] mafia," Samir Qumsiyeh, a Bethlehem Christian leader and owner of the Beit Sahour-based private Al-Mahd (Nativity) TV station, told WND in an interview in 2007. "It is a regular phenomenon in Bethlehem. They go to a poor Christian person with a forged power of attorney document, and then they say we have papers proving you're living on our land. If you confront them, many times the Christian is beaten. You can't do anything about it. The Christian loses, and he runs away," Qumsiyeh told WND, speaking from his hilltop television station. Qumsiyeh himself said he was targeted by Islamic gangs. He said his home was firebombed after he returned from a trip abroad during which he gave public speeches outlining the plight of Bethlehem's Christian population. One Christian Bethlehem resident told WND her friend recently fled Bethlehem after being accused by Muslims of selling property to Jews, a crime punishable by death in some Palestinian cities. The resident said much of the intimidation comes from gunmen associated with PA President Mahmoud Abbas' Fatah organization. 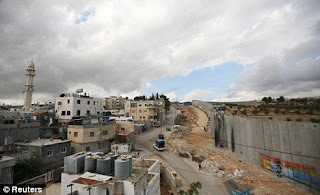 A February 2007 Jerusalem Post article cited the case of Faud and Georgette Lama, Christian residents of Bethlehem who said their land was stolen by local Muslims. When they tried to do something about it, Faud was beaten by gunmen. One religious novelty store owner recently told WND that Muslim gangs regularly deface Christian property. "We are harassed, but you wouldn't know the truth. No one says anything publicly about the Muslims," he said. "This is why Christians are running away." Christian persecution is a trend throughout the Middle East.